From the Glassmen Web site: There's no place like home! The Glassmen have finally returned to U.S. soil and are hitting the ground running in preparation for the next five weeks of their world tour. The buses pulled up to Heathrow Airport Tuesday evening, just in time for the corps to get checked in for the first of two flights home. With lots of security checks and immigration stops, the first group made it onto their plane just in time, and the second flight wasn't too far behind. There were no problems at all coming back through U.S. customs, and after a brief wait for the transportation to arrive, the Glassmen were back on their own buses and on their way! 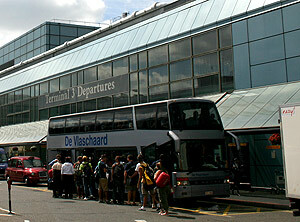 The Glassmen unload a bus at the departure terminal at Heathrow Airport. The corps will be rehearsing near Elizabeth, Pa., for the next few days in preparation for that show on Friday, July 7, where the corps will make their first post-European tour performance. The members are very excited to be back in the U.S. and getting down to the business of drum corps. Even Belgian Glassmen member Youri Debaere said, "I was happy to be at home, and performing with the Glassmen for my friends and family, but I'm glad to be back in America for what I came for - true American drum corps!" The Glassmen members all carry with them a lifetime of memories from their trip to Europe and are about to create a lifetime more as they begin the final leg of their journey around the U.S. entertaining audiences of all cultures and ages with their timeless show, "Beethoven: Mastery and Madness." Read more about Glassmen's European trip on www.glassmen.org.